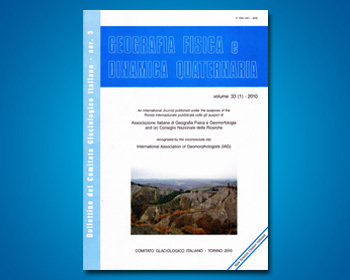 CILLA G., COLTORTI M. & DRAMIS F.
On the basis of detailed morphological, sedimentological and stratigraphical investigations the Early Holocene evolution of the source area of the River Esino (close to Esanatoglia, Umbria-Marche Apennines) is outlined. Particularly important in this framework was the emplacement of thick deposits of phytohermal and phytoclastic travertine, favoured by the presence in the waters of a greater amount of CO, deriving from densely vegetated slopes. Beginning from 3.500 y. B.P., the travertine deposition underwent a progressive reduction and than ceased possibly connected with anthropic deforestation.